This week you will be exploring the properties of alcohols. It’s a pretty quick and straight-forward lab. I will start by mentioning some important points about alcohols, and then I will go into each of the three experiments for this lab. One thing to mention about alcohols right off the bat: in general, they have higher boiling points than other organic compounds. This is because they are capable of hydrogen bonding. Recall that in order to hydrogen bond, a molecule must have a hydrogen directly attached to either a nitrogen, oxygen, or fluorine (the three most electronegative atoms). Alcohols by definition contain an –OH group (called a hydroxyl group) and so can hydrogen bond. Notice the difference in boiling points between an ether and an alcohol with the same molecular formula. Like many other function groups, the reactivity of alcohols varies greatly with their substitution (whether a molecule is a primary, secondary, or teriary alcohol). An alcohol whose –OH group is bonded to a primary (1º) carbon is a primary alcohol. Carbons that are bonded to one other carbon are primary. Carbons that are bonded to two other carbons are secondary (2º), and those bonded to three other carbons are teriary (3º). The general rule for solubility is “like dissolves like.” That is, polar molecules are soluble in polar solvents, and non-polar molecules are soluble in non-polar solvents. The hydroxyl group (–OH) is very polar, and so many alcohols are soluble in water, which is also very polar. Hydrocarbons (compounds containing carbon and hydrogen) are non-polar and so are insoluble in water. The general rule is that the more carbons on an alcohol, the less soluble it is in water. How can you tell when something isn’t soluble in water? If a liquid is insoluble in water, adding it to water will turn the solution cloudy, or turbid. When two liquids are soluble in each other they mix together perfectly and are said to be miscible. Based on all this, you can expect ethanol and isopropanol to be more soluble in water than 1-butanol, which in turn will be more soluble than cyclohexanol. (Both ethanol and isopropanol are miscible with water). The Lucas test tells whether an alcohol is primary, secondary or tertiary. Tests like this were once regularly used to determine the structure of molecules. But modern structure elucidation methods like NMR have made such tests obsolete. What is the Lucas test? It’s just the SN1 reaction of an alcohol with HCl. The Lucas reagent is ZnCl2 in concentrated HCl. Recall that in SN1 reactions, a carbocation is formed. So alcohols that form stable carbocations will react faster than alcohols that form less stable carbocations. The product of this reaction is an alkyl chloride, which is insoluble in water; it’s formation will turn the solution cloudy. The rate with which a solution turns cloudy tells you whether the alcohol was 1º, 2 º, or 3. 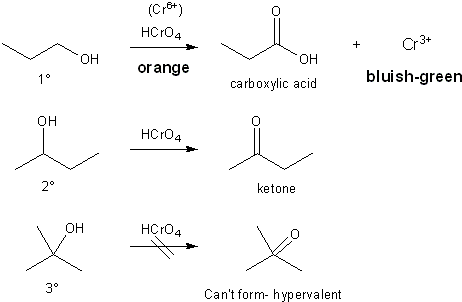 Tertiary alcohols will react and turn cloudy right away. Secondary alcohols will take a few minutes to react, and primary alcohols will won’t react at all. 3° carbocations are more stable than 2° or 1° carbocations and so form faster. Based on this theory, you can expect the 2-methyl-2-propanol (also know as tert-butanol) to react faster than 2-butanol (also known as sec-butanol). 1-Butanol won’t react at all. You might be wondering how the zinc gets involved in this reaction. Zinc is a Lewis acid, and so can accept a lone pair on an oxygen atom, resulting in a positively charged oxygen, which then acts a leaving group, leaving behind a carbocation. This is similar to what happens when oxygen picks up a proton, but happens even faster when zinc is present. So zinc speeds up the formation of the carbocation, which increases the rate of reaction. The Lucas test will go faster with ZnCl2 than in its absence. Zinc is a Lewis acid, and so speeds up the formation of the carbocation. In organic chemistry, oxidation state is determined by the number of heteroatoms bonded to a carbon. A heteroatom is an atom that is not carbon or hydrogen (such as oxygen, nitrogen, bromine, etc.). 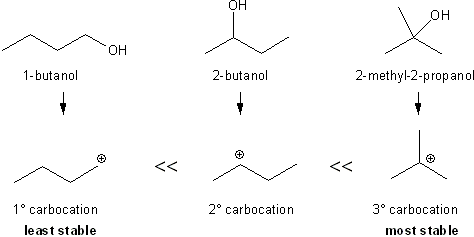 In the figure below, 2-bromobutane and 2-butanol are both oxidation state I. The diol in the middle is in oxidation state II, as is the carbonyl (a double-bonded oxygen counts twice). Carboxylic acids are in oxidation state III. Going from state I to II to III is called oxidation (going the other way is called reduction). Chromic acid will oxidize primary and secondary alcohols. 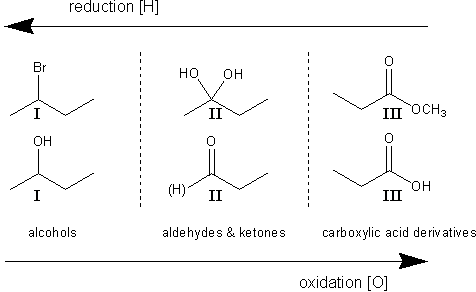 Primary alcohols are converted to carboxylic acids and secondary alcohols are converted to ketones. Tertiary alcohols are unaffected by oxidation, but since the conditions are acidic, will dehydrate to alkenes which themselves can be oxidized. (You will learn more about this in Carey chapter 15). Chromic acid is also known as the Jones reagent. Its oxidation state is +6 and it has an orange color. After a successful oxidation it is converted to chromium with a +3 oxidation state, which has a bluish-green color. So, primary and secondary alcohols should turn bluish-green when treated with the Jones reagent, while tertiary alcohols will show no color change. The mechanism of this reaction goes beyond the scope of the laboratory, but know that primary alcohols should react faster than secondary ones. That’s it for this week. Feel free to leave me questions below.